The regulative network conducting adult stem cells in endogenous tissue repair is of prime interest for understanding organ regeneration as well as preventing degenerative and malignant diseases. One major signal transduction pathway which is involved in the control of these (patho)physiological processes is the Wnt pathway. Recent results obtained in our laboratories showed for the first time that canonical Wnt signaling is critically involved in the control of the migration/invasion behaviour of human mesenchymal stem cells (hMSC). In the first part of this review, we describe that the regenerative state is closely linked to the activation of the Wnt pathway. Central hallmarks of activated stem cells are recapitulated in a similar way also in cancer metastasis, where the acquisition of an invasive cancer stem cell phenotype is associated with the induction of Wnt-mediated epithelial to mesenchymal transition (EMT). In the second part, the influence of proinflammatory cytokines such as transforming growth factor (TGF-)β1, interleukin (Il-)1β, and tumor necrosis factor (TNF-)α is discussed with regard to the invasive characteristics of hMSC. In this context, special attention has been paid on the role of matrix metalloproteinases (MMPs), such as MMP-2, MMP-9 and membrane type 1 (MT1)-MMP, as well as on the tissue inhibitors of metalloproteinases TIMP-1 and TIMP-2. Putative cross-talks between different signal transduction pathways that may amplify the invasive capacity of this stem cell population are also discussed. 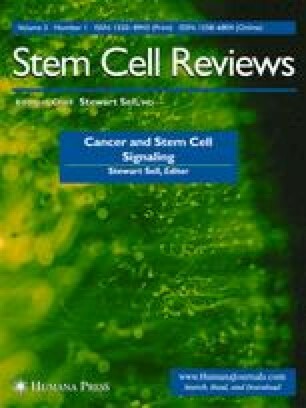 Finally, the consequences towards future drug-mediated therapeutical modifications of Wnt signaling in stem cells and tumor cells are highlighted. P. Neth and C. Ries contributed equally to this work. We would like to thank Prof. Dr. Edwin Fink for critical reading of the manuscript. Relevant research in the laboratories was funded by grants from the Förderprogramm für Forschung und Lehre of the Ludwig-Maximilians-University of Munich (P. Neth), from the Wilhelm Sander-Stiftung (2002.122.1) and by a contract from the German Federal Ministry of Defense (M/SAB1/5/A001) (C. Ries/M. Jochum).